Our researcher is still working hard on part two of his explanation of why the Norfolk Regiment were in the Middle East during WW1 but in the meantime has come across the following to add to his first post. This cartoon appeared in the humorous magazine ‘Punch’ in 1911. 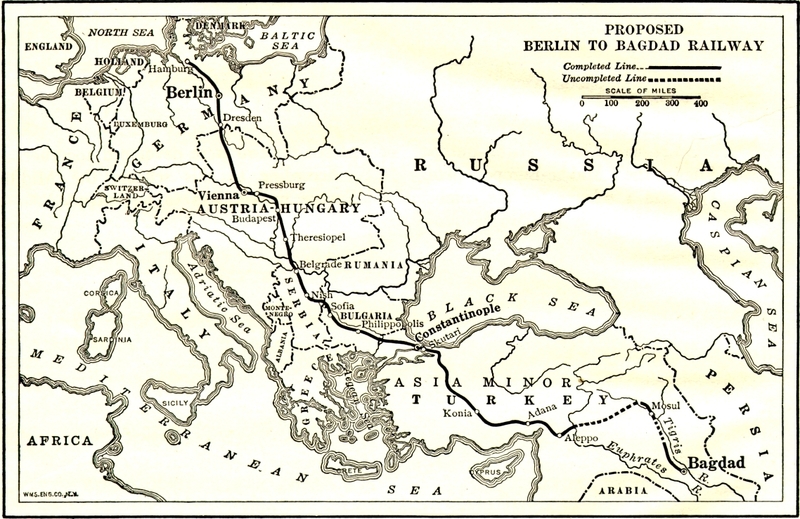 It illustrates an important element of German foreign policy in the years before the deployment of the 2nd Battalion the Norfolk Regiment to Mesopotamia in 1914. 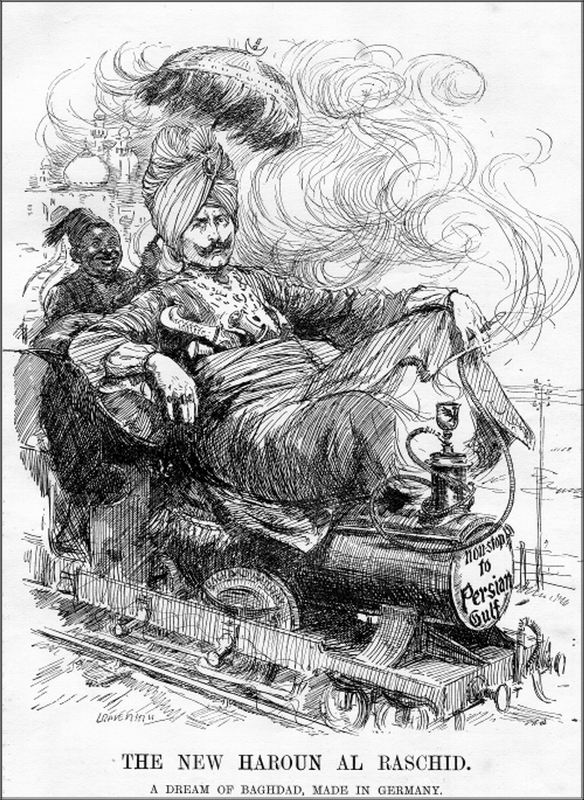 Kaiser Wilhelm II, dressed as the Caliph Harun al-Rashid, is riding a train on the proposed Berlin to Baghdad Railway, heading for the Persian Gulf and the routes to India and the East, and to the oil interests of the Anglo-Persian Oil Company at the head of the Gulf. A personification of Turkey, a smaller figure complete with Fez, typical of the national stereotypes of the time, is shown behind the Kaiser, suggestive of Turkish complicity in German ambitions. The domes of the mosques of Constantinople (modern Istanbul), the Ottoman (Turkish) capital, appear in the background. Harun al-Rashid (763-809 CE) is the most famous of the Caliphs of Baghdad who presided over a golden age of Islamic science, art and music. He founded the great Library of Baghdad, and some of the fictitious stories of ‘The One Thousand and One Nights’ are set against the backdrop of his magnificent court. About the time when this cartoon appeared, or shortly afterwards, T.E. Lawrence (Lawrence of Arabia) is believed to have been collecting intelligence about the construction of the railway when he was working as an archaeologist at Carchemish on the Euphrates in what was then part of the Ottoman Empire, modern Syria. Part two of Mesopotamia – Why? should hopefully be published in the first week of December. This entry was posted in research project and tagged Mesopotamia, Norfolk Regiment, railways. Bookmark the permalink.